5 What Are The Advantages Of Window Air Conditioners? 6 How Much Noise Do Window Air Conditioners Make? 8 Keep Your Window AC Quiet For Years! Using the quietest window air conditioner can improve the quality of your life. On average, people spend a third of their life at home, sleeping. So why should you spend that time in discomfort? If you don’t use an air conditioner during the warm season, you can’t sleep well. If you use a loud air conditioner, you can’t sleep at all. 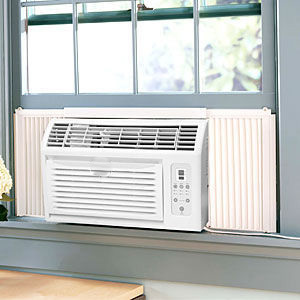 The best window AC unit is the one that can cool down your room without being loud. 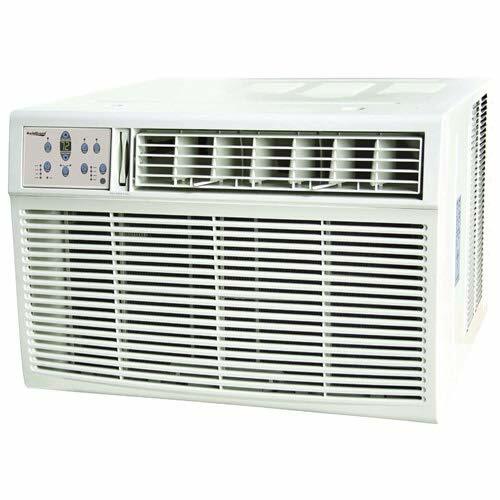 Read the window air conditioner reviews we prepared in this article to find out a model that can keep you cool without waking you up. DIMENSIONS : 26.5 x 26.5 x 18.6"
DIMENSIONS : 17.5 x 26 x 29.8"
DIMENSIONS : 23.6 x 25.4 x 17.9"
DIMENSIONS : 23.6 x 22.2 x 15"
DIMENSIONS : 21.5 x 19 x 14.5"
The Koldfront air conditioner is a great model for those who are looking for a unit that can cool a large surface. This model is capable of cooling down an area of up to 1,500 sq. ft. and it comes with a heat pump that will make the AC useable in the cold season as well. This model will produce enough heat to warm up a room of up to 700 sq. ft.
One of the good things we liked about this model is that it’s very effective. This model will cool down a room in a short time, and the room’s temperature will remain constant once you start using the AC. 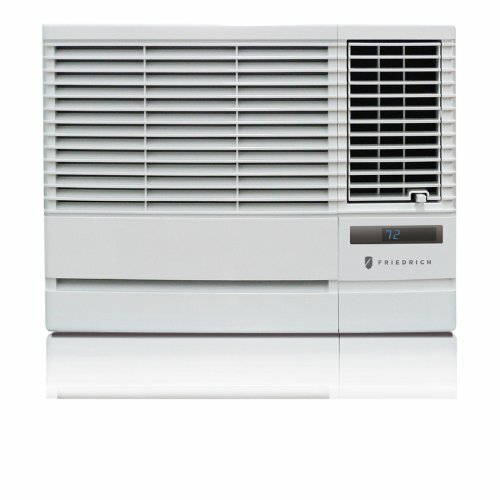 The Friedrich EP18G33B is a very efficient air conditioner that will make your home comfortable during the warm season. This model can produce up to 18,000 BTUs of cold air, more than enough to cool down an area of up to 1,000 sq. ft. Despite being a window air conditioner, this unit is a monster. 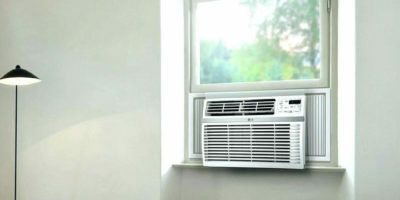 The Friedrich is probably one of the largest window ACs out there, and mounting and installing it is a two-person job. As far as the ACs effectiveness is concerned, this model will lower the temperatures in your home quickly. Moreover, this unit comes with a heat pump, so you can use it during the cold season as well. Heat Pump – This model uses a heat pump, so you can use it during the cold season as well. 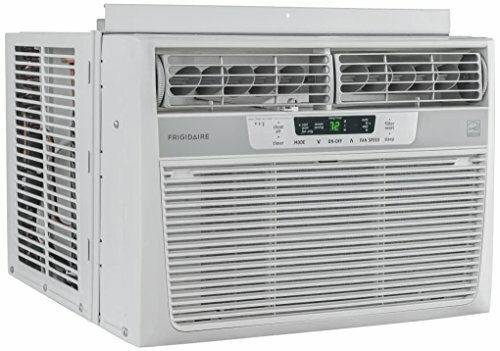 The Frigidaire window-mounted air conditioner is a good model for those who are looking for a silent unit that’s capable of cooling down a large room. Despite its massive size, this model runs silently, so you can even sleep soundly next to it. One of the things we appreciated about this model is that it comes with an easy-to-follow instructions manual. The manual will provide a clear installation guide, so you will be able to install the AC by yourself without too much trouble. However, you should consider asking another person for help because the unit is heavy. Large – This model is large, so you might find it difficult to fit it in a typical window. The LG LW1216ER is a popular model, and it’s easy to see why. 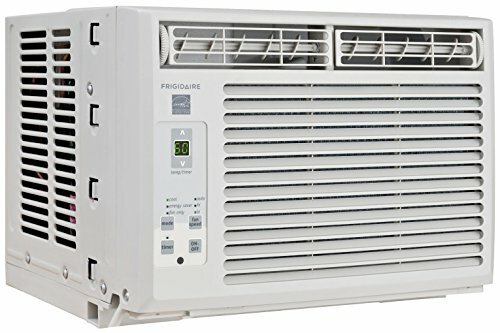 This AC incorporates a lot of useful functions, and it comes at a good price. We were impressed with the features this model offers. The AC comes with a 24-hour on/off timer that’s easy to program. The timer will not only allow you to program the AC to run when you want it to, but it can also lower your expenses because you don’t have to leave the unit running when you’re not at home. The AC also has an energy-saving option that will lower its consumption. As far as its cooling capacity is concerned, this model produces up to 12,000 BTUs that should cool down a surface of up to 550 sq. ft. 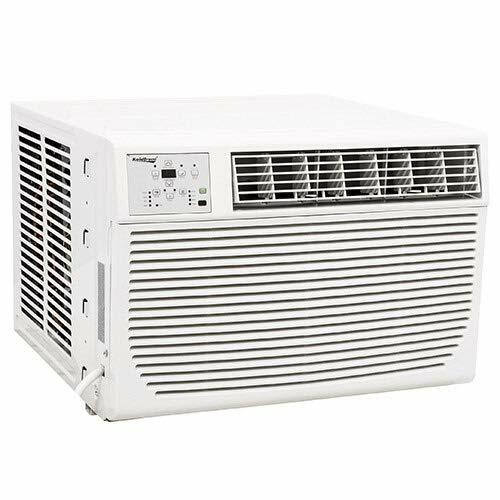 The Frigidaire 10,000 BTU air conditioner is a good model for those who are looking for a model that can cool rooms of up to 450 sq. ft. This AC has a quiet operation that will give you the possibility to use it while you’re sleeping without waking up. One of the things we liked about this model is that it comes with a built-in ionizer that will purify the air. This is a very helpful feature, especially if you suffer from dust or pollen allergies. Another good thing about this model is that it comes with a temperature sensor in the remote control. This will allow the AC to maintain a constant temperature in the room. 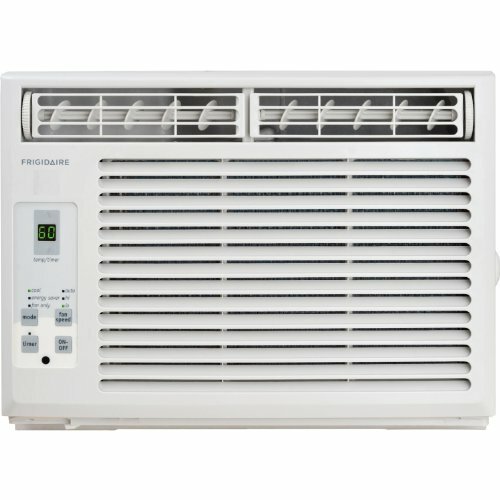 Now the price of this unit may seem too high compared to some other air conditioners but this Frigidaire FFRA1011R1 can cool a room up to 450 square feet. Looking at this window-mounted mini-compact gadget you would say that this is impossible, but trust us, it is possible. The British Thermal Unit of this air conditioner is 10 000 BTUs and it can remove up to 2.7 pt. of water from the air per hour. You could just sit on your couch and enjoy the fast work this air conditioner will do for you. The unit also features mechanical rotary controls and eight-way air direction control that ensures the even distribution of the air in every corner of your room. The reduction of bacteria and the cool, clean air are guaranteed for the device offers you a washable filter with front, tilt-out access. You will be able to conserve energy and save some money due to the low power start-up. DIMENSIONS : 28 x 25.5 x 17"
DIMENSIONS : 21.5 x 19 x 14.6"
The Koldfront WAC12001W is a large capacity AC that can be used for cooling and heating purposes. This model can produce up to 12,000 BTUs when it’s cooling, and it can cover an area of up to 550 sq. ft. As a heater, the AC produces up to 11,000 BTUs and it can warm up surfaces of up to 450 sq. ft.
We liked that this model comes with 4-way directional louvers. Using the louvers will ensure that the cold or warm air the AC produces will be spread evenly throughout the room. Another good thing about this unit is that it uses a thermostat. The thermostat is accurate, and it will help the AC maintain a constant temperature in the room. Installation Instructions Could Be Better – The AC’s installation instructions are sometimes difficult to follow. 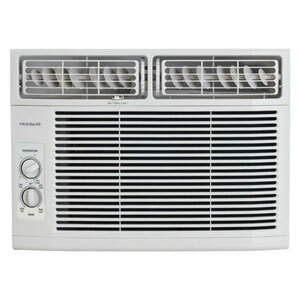 The Friedrich Chill is a window air conditioner that incorporated many useful features. This model is capable of producing up to 6,000 BTUs, which should be more than enough to cool down a room of up to 250 sq. ft.
One of the things we appreciated about this model is that it comes with many features that improve its efficiency. The AC uses a 24-hour thermostat that will allow you to program the unit on and off times. The digital thermostat will allow the unit to maintain a constant temperature in the room, and the auto-restart feature will start the AC using its previous settings. The Koldfront WAC10002WCO is a good cooling solution for those who want to increase the comfort of a medium-sized room during the warm season. This model produces up to 10,000 BTUs of cold air, and it can lower the temperature in a room of up to 450 sq. ft.
A good thing about this model is that it comes with good installation instructions. A single person could install the AC, but having a second one to help can make the process quicker and easier. The unit’s energy saving mode is effective, but it might make the AC slightly less efficient when it’s engaged. Easy Installation – The AC’s installation is easy and straightforward. Energy Saving Mode Lowers Efficiency – The cooler comes with an energy saving mode, but using it might make the room’s temperature to rise. 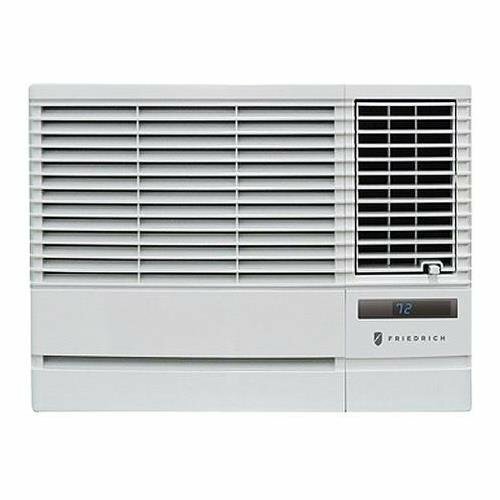 The Frigidaire FFRE0533S1 is a great window-mounted air conditioner for those who are looking to increase the comfort of a small room during the warm season. This model will produce up to 5,000 BTUs of cold air that will cool down a room of up to 150 sq. ft.
We were impressed with the AC’s easy installation and efficiency. 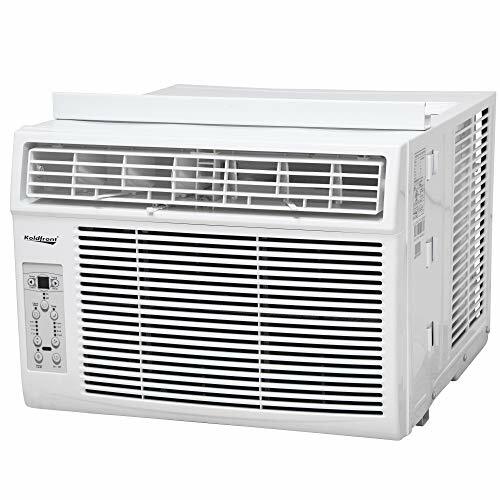 Despite its small size, this unit will cool down a small room very quickly, making comfortable enough to sleep in even in the warmest days of the year. As far as the cooler’s noise is concerned, this model is really quiet and it won’t produce any sounds louder than what a fan would produce. Poor Quality Control – Some customers complain that the AC arrived with missing parts. 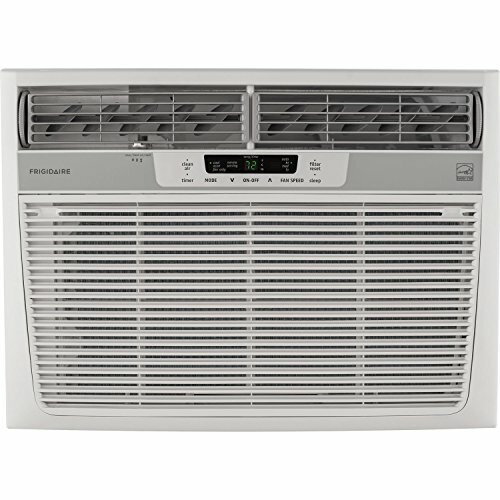 The Frigidaire FRA054XT7 is a good choice for those who want to cool down a small room. This unit produces up to 5,000 BTUs of cold air that can make a room of up to 165 sq. ft. comfortable during the warm season. We liked that this model is really quiet. The AC is suitable for small rooms, where every small noise can be bothersome. Luckily, the sound produced by this model can be called white noise and it won’t disrupt your usual activities. In fact, this unit is quieter than most box fans. The AC is small, and installing it won’t take too long. The installation kit comes with a foam strip that will help with making a seal, improving the unit’s performance. No Spare Parts – Unfortunately, Frigidaire doesn’t produce spare parts for this unit so if something goes amiss, you can’t repair it. One of the most frequent arguments you’ll encounter when talking about window ACs is that they’re noisy. People are reticent to use them because they believe that a window AC will disrupt daily activities such as talking on the phone or watching TV. But after thorough research and testing, we believe we found the quietest window air conditioners on the market. Like all sounds, the sound air conditioners produce is measured in decibels (dB). The first thing we did was to look for window air conditioners that come with a low decibel rating. The lower the decibel rating, the quieter a unit will be. Now, according to their decibel ratings, the quietest air conditioners produce up to 50 – 60 dB. But what does that actually mean, what will you hear? You might have noticed that the differences between a working garbage disposal and a quiet conversation are not that large. After all, since a whisper produces 20 dB, so much difference can 30 dB make? Honestly, the actual difference might be more difficult to grasp. When it comes to decibels, the differences are not as linear as they seem. For example, a quiet conversation produces 50 dB whereas the noise in a busy office has a rating of 70 dB. Believe it or not, but 50 dB actually represent one-fourth of the 70 dB value. 80 dB is 2 times louder than 70 dB, and 60 dB is only half of 70 dB, and so forth. As far as regular air conditioners are concerned, their noisiest part is the compressor that’s placed outside the building. Window air conditioners don’t use a separate compressor, so they tend to be louder than regular units. What If It’s Not Quiet Enough? Most window air conditioners are quiet enough to be barely noticeable under normal circumstances. The air conditioner’s noise rating is the first thing you should check when you’re shopping for a quiet unit. Window air conditioners are not difficult to install, and most models come with useful installation instructions that can guide you step-by-step through the installation process. However, a faulty installation can make the air conditioner noisy, no matter its noise rating. You should always make sure that you install the air conditioner on a leveled surface. Moreover, you should ensure that the AC’s supports are sturdy and stable enough to support the air conditioner when it’s working without allowing it to move. If you detect any rattling sounds, you should double check the AC’s installation, because the unit shouldn’t produce such a noise. Sometimes people do not pay enough attention to properly insulating the air conditioner. The insulation will not only increase the AC’s efficiency, but it will also lower the noise it produces. A window AC might have a built-in compressor, but the compressor is facing outwards. It’s true that not even the best insulation will tune out the noise produced by the compressor, but it will surely dampen it so it’s barely noticeable. AC properly is to follow the installation guide. If the unit doesn’t come with a good installation guide, you can check online for solutions or video tutorials, or you can even contact the manufacturer’s customer support service. There are a lot of things you should take into consideration when you’re looking for the quietest window air conditioner. Here’s what you should look for. Few things are worse than buying an air conditioner and realizing it’s not powerful enough to cool down the room you install it in. On the other hand, investing in a model that’s too powerful for the room might make it uncomfortable to use. Every time you turn on the unit, it will make the room so cold you would shiver. Moreover, an oversized unit will turn off and on very often which can lead to higher energy consumption and lower efficiency. You can use the following recommendations to make sure the window air conditioner you choose is sized for the room you’re planning to install it in. If the room is sunny during the day, you should increase the BTUs by at least 10%. If the room is shaded during the day, you can decrease the BTUs by up to 10%. You should increase the BTUs by 10% for every window that sits in direct sunlight. You can decrease the BTUs by 5% for every window if they’re shaded. Each BTU rating is estimated for a maximum number of 2 occupants. For every additional person, you should add at least 600 BTUs. You should also take into consideration the room’s function. A bedroom has to be cool, but the kitchen has to be cooler. Bedrooms usually have to be cool at night when it’s colder outside, so you can decrease their BTUs by up to 30%. Rooms that house many gadgets and appliances tend to be warmer than those that don’t, so you should increase their BTUs by at least 1,000. If you cook frequently, the kitchen will be the warmest room by far, so you should increase its BTUs by 4,000 units. Undersized Units – If you choose an undersized unit, the air conditioner will run continuously to decrease the room’s temperature. This process can be inefficient, and it can lead to significant operating costs. Moreover, since the air conditioner is undersized for the room, it won’t be able to reduce the temperature as quickly as you would wish, or to a comfortable level. In fact, if the AC is undersized you might not even notice it’s on unless you sit right next to it. Oversized Units – If you choose an oversized unit, the AC’s operating costs will surely be higher. However, despite the costs, the air conditioner will lower the room’s temperature quickly. In fact, the AC might cool down the room so drastically you might find it uncomfortably cold. If this happens, you can always increase the room’s temperature by selecting the AC’s fan-only operating mode or by turning it off. One of the major downsides of choosing an oversized unit is that it might not be comfortable to use at night. If you leave it on before you go to sleep, you might wake up shivering. If the AC uses a thermostat, it will turn off and on very frequently, further increasing its operating costs. Oscillating Louvers – Air conditioners that use oscillating louvers will spread the cold air faster throughout the room. Instead of blowing the air in a single direction, the models that use this feature spread it from left to right. Thermostat – Air conditioners that use a thermostat will turn on and off automatically once they reach your desired temperature to keep it constant. Auto Restart – Window air conditioners that use this function will automatically restart using the last known settings in the case of a power outage. What Are The Advantages Of Window Air Conditioners? Easy Installation – Window air conditioners have an easy installation, so you can install them yourself without paying a professional. Removable – These ACs are removable, so they are good choices for renters. Good Cooling Capacity – Despite their low prices, these models have good cooling capacities. How Much Noise Do Window Air Conditioners Make? Window air conditioners are some of the noisiest AC models available. One of the reasons they produce more noise than other types of units is because they house the motor and the compressor in the same unit. Another reason for their noise is the fact that both the motor and the compressor are inside your house. 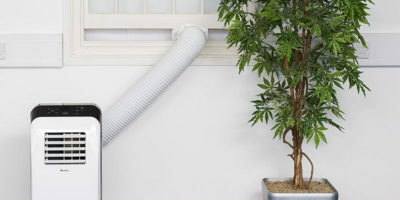 Duct air conditioners use a large unit that’s placed outside for the compressor, so even though theoretically they’re louder, you will only hear the noise of the ducts as they blow the cold air in your house. Split ACs use a separate unit as well. These models do not use such a large compressor as the duct models, but even so, the compressor is placed outside your home so you won’t hear it. However, besides using the same unit to store the motor and the compressor, there are some other factors that make window ACs noisy. One of these factors is its installation. Window ACs have an easy installation, so most people take it upon themselves to install them, without using a professional. And while some people can do a great job, some will botch up the installation. Not only will a lousy installation make the window AC noisy, but it will also make it less efficient than it should be. Another problem people often report when installing a window air conditioner is a rattling noise they hear when the AC is working. You might be surprised to find out that the rattling noise is not actually produced by the AC unit, it’s produced by the vibration of the unit’s supports or the window sill. Most often than not, the window sill will vibrate violently when the AC’s motor runs, so it will produce loud noises. If you make sure the air conditioner is installed properly and that the unit’s support and the window sill are anchored, you will be delighted to discover that the air conditioner doesn’t produce any loud sounds at all. You might be surprised to find out that determining the running costs of a window air conditioner is not an exact science. Sure, there are certain ways to calculate these costs, but there are also a lot of factors you should take into consideration before starting these calculations. Capacity – The higher the unit’s capacity, the larger the bill. 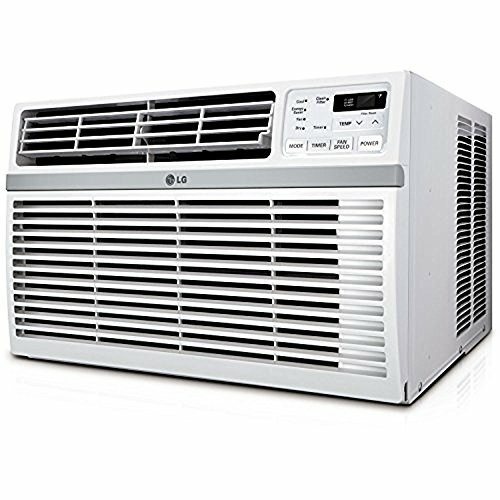 An air conditioner that produces 5,000 BTUs will consume less energy than a unit that produces 25,000 BTUs. Energy Rating – Each air conditioner has an energy rating. As a rule of thumb, most window air conditioners are energy-star rated, so they’re very efficient. However, being efficient is not the same thing as having a low energy consumption. It only means that most of the energy the AC uses is transformed into the cool air. Wattage – Every air conditioner has used a certain amount of energy to run. As you would expect, larger models will consume more than small ones. Ambient Temperature – Most air conditioners use more than one speed to cool down a room. If the ambient temperature is high, the air conditioner will compensate by using a higher fan speed. This will increase the AC’s consumption. Thermostat – Units that use a thermostat have a lower energy consumption than those that don’t. When they use a thermostat and they reach the specified temperature, the thermostat will stop working and it will only turn on periodically to keep the temperature at a constant level. Units that don’t use a thermostat will run continuously until you turn them off manually. Occupants – The air conditioner will run for longer when there are more occupants in the room. Each occupant will produce heat, so the AC will produce more cold air to compensate. Now that you know how to determine the AC’s power consumption, let’s take a look at some concrete examples. On average, running a window air conditioner will cost roughly 60 cents per hour when they’re cooling a room. When they’re using their heat pumps, running the air conditioners will cost roughly 25 cents per hour. Of course, these prices are highly dependent on the electricity cost in your area, the unit’s size, and the ambient temperature. Keep Your Window AC Quiet For Years! If you want to keep a window air conditioner efficient and quiet for years you will have to make some periodical maintenance. The first step in doing so is to read the instructions in the user manual. Most manufacturers recommend some maintenance work for their products. Clean The Air Filter – The AC’s air filter should be cleaned at least once a month. You can access the air filter by removing the front panel. Clean it using warm water and a mild detergent or white vinegar. Let it dry completely before reinstalling it. Replace the filter if you notice any tears or holes. Remove Insect Nests – The air conditioner can provide a good cover for insect nests. If this is the case, you should remove the nests before you start using the unit each year. Change The Remote Control’s Batteries – Make sure you remove the remote control’s batteries before each cold season if you won’t use the AC for heating. You may also like portable air conditioners or you can choose a tower fan based on its capacity. 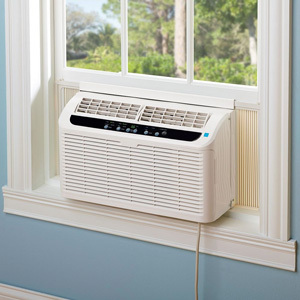 As you could see in our window air conditioner reviews, the best window AC unit is the one that can cover the room you install it in without overdoing it. Even though it can be time-consuming it’s better to measure the room and its temperature leaks twice before deciding on a model. Besides being silent, the quietest window air conditioners are also efficient. These models can cool down a room in quick succession, without making it so could you’ll shiver. And the best thing is, with some yearly maintenance, these units can last for years if not decades.